✽ Chop the onions and parsley. ✽ Cut the lemon into wedges and remove the pips. ✽ Cook the bacon lardons for 10 minutes on 200°C and then place them under the grill until they’re golden. 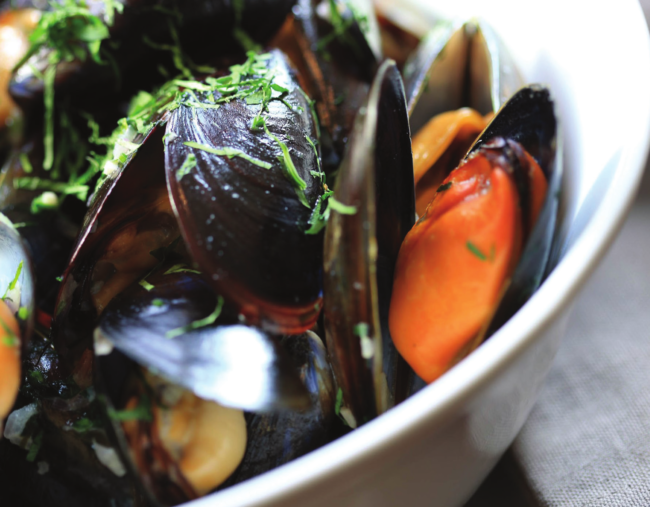 ✽ Clean the mussels and place them in a heavy-based pot. ✽ Add the onions, bay leaves, thyme and white wine. ✽ Cover with a lid and steam on the stove for 1-to-2 minutes until all the mussels are open. ✽ Add the Roquefort, cream and lemon. ✽ Sprinkle with the bacon and parsley and serve in hot bowls.